For Brig Collier, who had no clue, even getting out of a cab had become a major ordeal. Worse, now he was talking to thin air. Fumbling for his wallet, his brain fogged from travel, he paid the fare then heaved himself from the taxi’s rear seat out into the pouring rain. He reached back inside for the overstuffed diaper bag and, finally, for the baby. The required car seat was no easy thing either. In the past twenty-four hours, through seven and a half time zones, he had seen females nowhere near his size juggle crying infants, fussy toddlers, and screaming five-year-olds without breaking a sweat. He figured it must have something to do with different elbow joints and bone structure. Laila just didn’t seem to fit in the crook of his arm and one tiny leg insisted on poking from her blanket. Poor kid. Brig felt like a total failure. Never mind the adrenaline-charged black ops stuff that was his bread and butter. He was still trying to deal with the shock of being, all too suddenly, a stand-in father. He never knew what might come next. He waited while the driver unloaded their bags from the trunk. One for him, three for Laila. By the time she reached kindergarten, they’d probably be traveling with a U-haul. Brig frowned. Could it be more obvious that he didn’t know what he was doing? He always knew what he was doing. His life depended on it…and so, unfortunately, did others. As if he needed that reminder, now he had Laila, and Brig meant to do right by her. He gazed around, but for one jet-lagged second he couldn’t remember where he was. Oh, yeah, not in Wardak province. There were no bullets whizzing past his head in Afghanistan here. This was Liberty Courthouse. Small-town America in the heartland of Ohio. His heartbeat settled. He was looking straight at his parents’ neat suburban house, the safe place he needed for Laila. The baby whimpered. Cold water dripped from Brig’s hair, making him shiver. And he realized he was standing in the rain like a turkey with its mouth open. Laila was getting wet, too. Brig hurried up the walk to the modest gray house he’d once called home. Alarm flashed through him. How could that be? After he leaned on the doorbell a third time, he realized no one must be inside. Brig hadn’t been here in a while. He had no door key to the house. Laila would need a bottle soon, dry clothes, a clean diaper. Other than his missing parents, he had no relatives in town. Like Brig, his friends had moved away. As for the neighbors here…He’d burned that bridge, especially with her, long ago. In the next minute he was picking a path across the sodden lawn anyway with Laila in his arms. 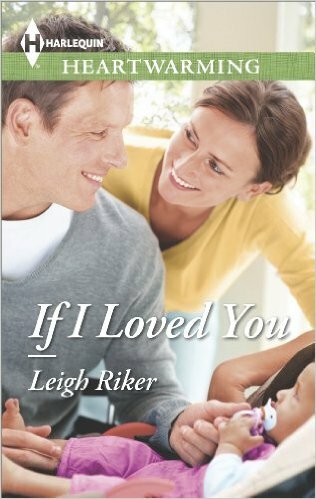 He’d left her car seat and their luggage except for a diaper bag on his parents’ doorstep to lighten the load, but the insistent memory of a brown-haired girl with laughing green eyes weighed him down at every step. Molly. He’d be lucky if she didn’t kick him across the street. The very picture of a desperate man, he carried Laila up the sidewalk to Molly’s white frame house next door. Probably she no longer lived here either but in any case her dad would likely greet him with a shotgun. Brig didn’t have much choice. The baby needed shelter from the blowing rain. He climbed the steps, one foot slipping on a wet slate tile. Startled, he lost his balance, nearly tossing himself and Laila into the rain-flattened peony bushes below that flanked the porch. He grabbed the railing to steady himself at the same time a blast of noise from inside the house assaulted his eardrums. A party? Not in his honor, for sure. Maybe he shouldn’t have come back to Liberty after all. But he had to think of Laila’s welfare now, not that of the men under his command—one lost man—half the world away. Or of his own. Molly didn’t believe in bad omens, as if there were any other kind, including the rain that now slashed against the windows. Yet she was already running late and even the red-and-white banner stretched over the dining room archway didn’t bring her usual smile. The growing horde of party guests in the living room, from six months to sixty years old, had begun to arrive early, well before mid-day (had she put the wrong time on the invitations? ), and most of them seemed to be talking at once. Every minute or two, the doorbell rang again. Normally Molly loved parties. At least she had loved them when there was something, with that special someone, to celebrate. Now, in the midst of her annual Valentine’s Day bash, she was merely going through the motions for other people. Maybe the romantic holiday itself had unsettled her. February was no longer her favorite month, and except for her dad Molly had loved only two other men in her life. The first she’d rather not think about. The second, sadly, was gone, too. Determined not to slide further into a slump, she turned to finish the party decorations, hoping no one noticed her disorganization. She should have stayed up later last night, but then she hadn’t expected people to get here this soon. She stuck another heart-shaped decal on the back of a dining room chair. And gave thanks for the blessings she still had. Her friends. Her family. Her widowed father. Thomas—also known as Pop—was already in his element, riding small children on his knee, telling corny jokes to the teenagers, ignoring his diet to drink a beer or two with the men. Molly wouldn’t spoil his fun. The family—and, most of all, Pop who still mourned the loss of her mother—relied on her. They needed her. She was great at, and proud of, holding them together. If this was her fate in life now rather than having a house full of the babies she had wanted so badly and a husband to love, so be it. Molly didn’t expect to find love again. Her family and Little Darlings, her day care center, had to be enough. And they would be. Molly was already in the planning stage for a much-needed expansion to the Center. If all went well, then she could take in more children, hire more assistants to improve her already good ratio of “teachers” to “students,” and enhance her program. Still, she couldn’t shake this stubborn sense of foreboding that something, something that would change her life again, was about to happen. And as if someone had been given a cue, the doorbell chimed once more. In a last attempt to alter her mood, she dabbed one remaining shiny red heart decal at the corner of her own mouth, like a beauty mark. Then Molly shoved the now-decorated chairs back under the table and went to greet her newest guest, determined to enjoy herself if it killed her. When she plowed through the crowded living room to open the front door, her smile instantly vanished. And Molly froze. Suddenly, she believed in all those bad signs. She knew exactly what was wrong. In the doorway stood a tall, all-too-familiar man. His piercing blue eyes met Molly’s equally shocked gaze of recognition and too many memories flashed through her mind. Molly’s heart tripped all over itself. She tried to look away, to focus on his rain-dampened hair, dark and sleek against his skull, but his gaze kept drawing hers back. Besides that oh-so-serious look of his, the one she had learned long ago not to trust, she had to admit he was still the most attractive man she’d ever seen. Molly exchanged a glance with her sister who stood on the other side of the living room, a party hat in one hand. Ann lifted her eyebrows and Molly stifled the urge to turn around and run. She was no longer a naïve twenty-two-year- old. He might still be handsome but at thirty, and a widow, she told herself, she was immune. Why let his abrupt reappearance shake her? Yet the bluish circles of fatigue under those eyes nearly undid her. If only she could hide behind the red heart pasted on her cheek, cool the heat that rose in her face. The last person she’d expected to see again was the same man she had once loved to distraction, the man who hadn’t wanted to make that final commitment to Molly on their wedding day. Brigham Collier. Her ex-fiancé, that first terrible loss in her life, the man she’d thought was still single and determined to stay that way, had come home. For Molly it was like staring at both of her shattered dreams.